Where are all the paintings from? 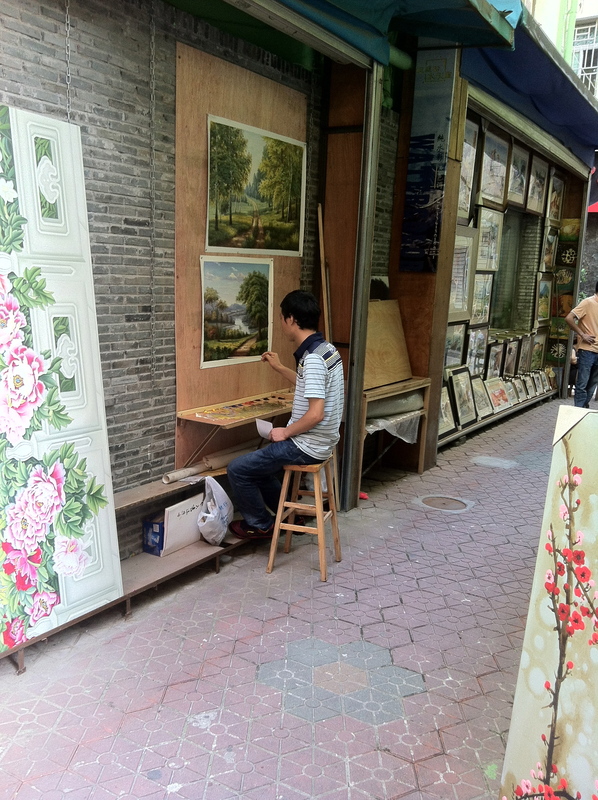 Have you ever wondered where all those “fake” paintings are from? Paintings you see in five star hotels all over the world. Maybe “fake” is a bit too harsh. Let’s classify them as “replica”. You would be surprised to know that most of them originate from Shenzhen, a city bordering Hong Kong. In fact, the area where they’re all from is just one square kilometer. Visiting Dafen village tended to be a tedious task. You either had to make sense of Shenzhen’s incomprehensible bus system or you just take a taxi from the border. Since last year, the situation has improved dramatically. You can just take the underground train from the border, 45 minutes later you reached your destination. Dafen is a collection of art galleries and art supplies shops. On an area of one square kilometer you find hundreds of galleries. From the prominent gallery on the road with English speaking staff to the back street painter. Everything can be made here. You want landscapes? A copy of a Picasso? Or just have your favourite wedding photo as a painting? You name it, Dafeng can make it. What was most surprising to me, having lived in Shenzhen for a few years, is the fact that Dafen exists at all. You see, Shenzhen is a new city. It’s just about 30 years old and the outcome of China’s opening up policy in the 1980s. China needed a capitalist playground where factories can be built – Shenzhen was born. Shenzhen has come a long way from being a cheap factory location. But it’s still primarily defined by business and money. People don’t really “live” in Shenzhen. No one would consider it as their home town. It’s a place where you spend a few years making money before you go back to your hometown. So it’s not surprising that the changes seen here are dramatic. Houses are built for ten or twenty years, then demolished and rebuilt. And that’s what should’ve happened to Dafen. It’s an old factory district and factories moved out of the city. So normally a property developer buys the area, knocks it all down and builds a bunch of 50 floor apartment building with a massive shopping mall on the ground floor. For some reason it hasn’t happened here. And thanks God! Because suddenly, something odd occurred. It seems there is a place in Shenzhen with flair! Not just the standard concrete block but an area with different colours, different design and just much more. Yes, it’s not some Italian renaissance city but hey, they try! 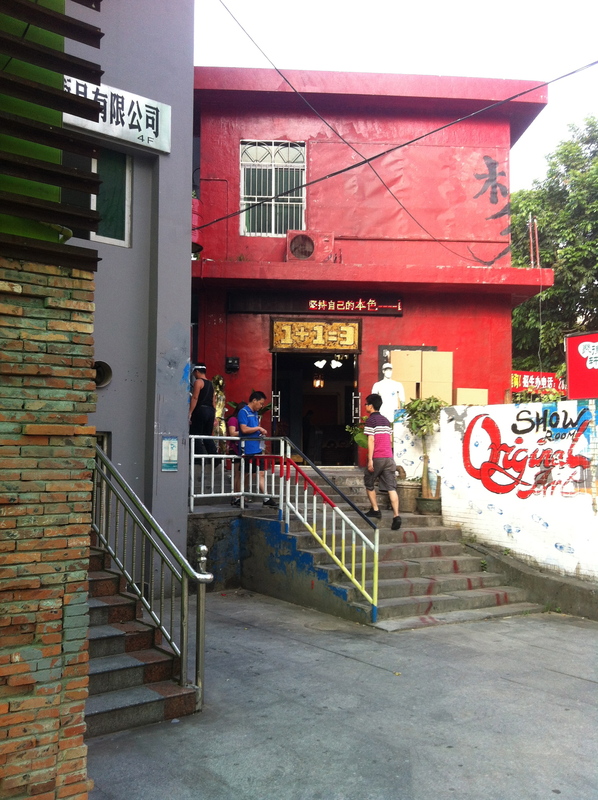 Dafen is a place in Shenzhen where I would even consider buying a place because I like the people around, the local neighborhood and it’s reasonably clean. And now with the metro in place, it’s really worth a thought….